Starting in November, at least 20 RVs will be allowed to park in an East Palo Alto-owned parking lot with access to portable showers and bathrooms as part of a new program designed to reduce the city’s homelessness crisis. Marianne Favro reports. Starting in November, at least 20 RVs will be allowed to park in an East Palo Alto-owned parking lot with access to portable showers and bathrooms as part of a new program designed to reduce the city’s homelessness crisis. "You can't afford rent here with a regular job, you have to have two jobs," said Vicente Moreno who has lived in a motorhome for the past nine months. 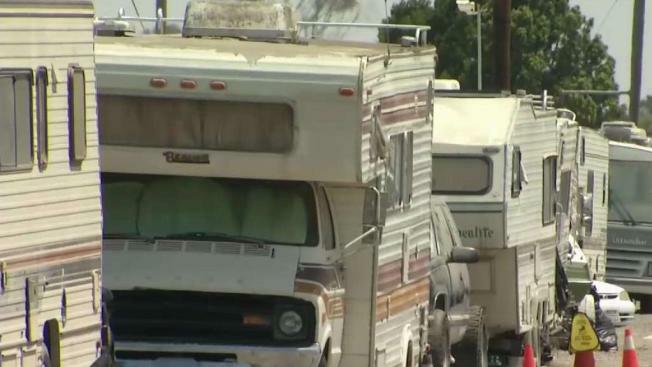 East Palo Alto City Council approved the new RV pilot program Tuesday with the idea to allow at least 20 families to park in RV’s overnight and connect them with services as dozens of motorhomes are parked on the streets. "This is a program that will get some RVs off the streets and provide them access to wrap-around services so they can eventually find housing," said Lisa Gauthier from East Palo Alto City Council. However, those living in the RV’s, like Moreno, said that they rather stay put rather than being required to move their RV every morning. "I think it would be good if they let us live there and not kick us out in the morning," he said. There’s also some pushback from some neighbors who claim they fear an increase in loitering and trash. Councilwoman Guathier said faced with the housing crisis, neighbors need to pull together. The program will prioritize families, the elderly and veterans. To qualify, people have to have a registered RV and must agree to participate in a case management program.